Special Offer. Buy 6 Bottles for £160.00 each. Save £30.00 !! Sir Winston Churchill was Pol Roger's most illustrious devotee and customer. This Champagne is made in his honour. Churchill's relationship with Pol Roger dates back to 1945, although he had been a loyal customer as far back as 1908. At a luncheon given by the British ambassador to France after the liberation of Paris, Churchill met the charming and captivating Odette Pol-Roger and began a friendship, indulged by his wife Clementine, which lasted until Sir Winston's death in 1965. Each year on his birthday, Odette would send him a case of vintage champagne. In honour of his friendship, Churchill named one of his favourite racehorses after her, and made sure that she was invited to lunch at the British embassy every time he was in Paris. Despite never actually visiting 44 Avenue de Champagne, Churchill proclaimed it "the most drinkable address in the world". So close was his relationship with the family that, on Churchill's death, Pol Roger put black-bordered labels on the bottles destined for the UK. In 1975, Pol Roger went one step further and named their prestige cuvée after him, making it in the robust, mature style that he liked so much. The grapes are all from Grand Cru vineyards which were under vine during Churchill's lifetime and it is only made in the very best vintages. It is made in a style which Churchill himself favoured: robust, mature and long-lived. The first "Cuvée Sir Winston Churchill" was from the 1975 vintage and was released, in magnum only in 1984 with the launch taking place at Blenheim Palace. There followed 1979, 1982, 1985, 1986, 1988, 1990, 1993, 1995, 1996, 1998,1999, 2000, 2002 and 2004. The latest vintage, 2006, is the sixteenth of this great cuvée and is released only after 10 years of cellaring. Produced in very small quantities, it is available in 75cl bottle and 150cl magnum. The wine displays a gorgeous white gold colour enhanced by a continuous thread of tiny bubbles announcing a lively effervescence. The delicate nose exudes scents of butter and brioche. Flavours of almonds and hazelnuts mingle with refined fragrances of yellow fruits dominated by the freshness of citrus fruits (tangerines). Then the wine opens up with savours of nougat and pistachio nuts. On the palate, the attack is fresh and reveals a perfect balance between acidity and suppleness. The aromas are reminiscent of the sweetness of cooked fruits associated with hints of almonds, dried fruits and quinces. As the wine warms in the glass, it turns more rounded. Its silky texture is supported by a stunning length. Champagne Pol Roger created their Prestige Cuvée in homage to Sir Winston Churchill mindful of the qualities that he sought in his champagne: robustness, a full-bodied character and relative maturity. The exact blend is a closely guarded family secret but it is undeniable that the composition would meet with the approval of the man to whom it is dedicated : "My tastes are simple, I am easily satisfied with the best". Pinot Noir predominates, providing structure, breadth and robustness whilst Chardonnay contributes elegance, finesse and subtlety. Composed exclusively of grapes sourced from Grands Crus Pinot Noir and Chardonnay vineyards which were already under vine during Churchill's lifetime. 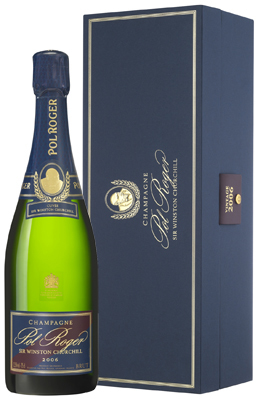 Cuvée Sir Winston Churchill is only made in the very best vintages and is always released later than the other vintage dated Champagnes from Pol Roger, marking Churchill's appreciation for older wines. The cellars extend some 7 kilometres beneath the streets of Epernay and are carved out of the local chalk over three levels, the deepest known as the 'cave de prise de mousse' at 33m below street level. As the name suggests this is where the wine undergoes its secondary fermentation in bottle. This deep cellar is at 9° or less, rather than a normal cellar temperature of 11-12°, thus prolonging this fermentation.